A British comedy that's classy and commercial - and, most important, very, very funny. Admittedly, as it charts the social, sexual and romantic fortunes of thirty-something Charles (Grant), a self-confessed serial monogamist, and the friends, old flames and potential lovers (notably MacDowell's rather enigmatic American beauty), who are his fellow guests at one wedding after another, the film's focus on well-heeled jovial oafs and its conventional attitude to modern relationships hardly make for 'radical romantic comedy'. But that's quibbling. Newell's direction switches smoothly between affecting intimacy and sequences of rowdy chaos; perhaps the film's trump card, however, is its emotional honesty, particularly in the poignant and sobering funeral scene. Genuine feel-good entertainment. Labelled as a rom-com, it is unsettling that the main love story fails to be truly endearing. All through the movie, it seems enough for two people to meet for 3 seconds to fall in love with each other. This enough fails to make this story relatable. Those characters are supposed to be the centre of the action, and yet the script manages to make them despicable. Between cheating on other people and marrying someone they don’t love, they’re described as selfish and annoying. Failing to connect with them and their struggles, I found the film all in all long and quite boring. So I'm a bit late to the game. I watched this for the first time this week, and it was fab! Just the right level of cheese, laughs, sadness. Hugh Grant was the perfect person to play the main role - a feel good film! 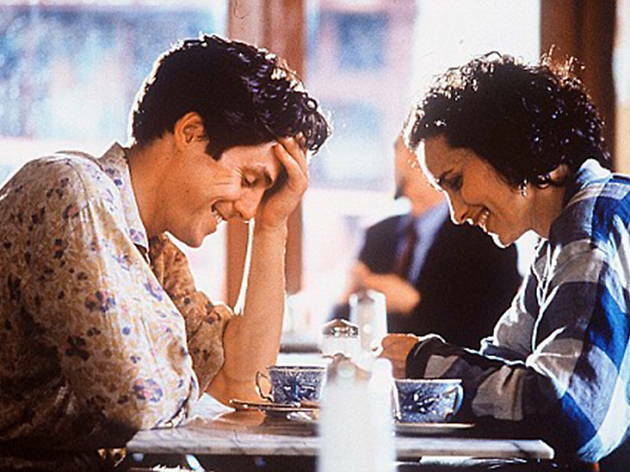 Four Weddings and a Funeral marks one of the early high points in Hugh Grant's romantic comedy oeuvre. As in films such as Notting Hill and Two Weeks Notice, he portrays an irresistible flake with the perfect amount of English sheepishness. The film includes stellar supporting performances from Simon Callow (A Room With a View, Shakespeare in Love, Kristin Scott Thomas (The English Patient) and Rowan Atkinson (Bean, Johnny English). Overall, the film sports a fantastic supporting cast. Like many Grant romantic comedies, the limelight is generously shared with a bevy of quirky supporting actors. Four Weddings and a Funeral is a fine example of English romantic comedy.